I'm Masami and I live in Naruto, Tokushima prefecture. I work as a freelance translator and the areas I mainly cover are General, Medical and Hotel Industry. I usually work in my room, but I would like to offer my assistance as an interpreter to foreigners who visit my beautiful home town Naruto, so I got a National Guide Certificate. My hobby is watching a soccer game and my favorite J league team is Tokushima Vortis. Their home stadium is in Naruto and the word "Vortis" means whirlpools in Italian that form in the Naruto Strait. The Naruto whirlpools are very famous and can be observed from ships, or from the Naruto Bridge which offers a spectacular view of Naruto Park. The Naruto Park also has a number of sightseeing points to enjoy. One of them is Otsuka Museum of Art. 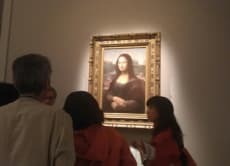 This museum reproduced master paintings in Western Art on ceramic boards in the identical sizes of the originals and its collection consists of more than 1000 items. I hope you will visit Naruto and have a wonderful time!